There are so many good ideas crammed into this project its hard for us to believe this isn’t already widely used for critical welding applications. 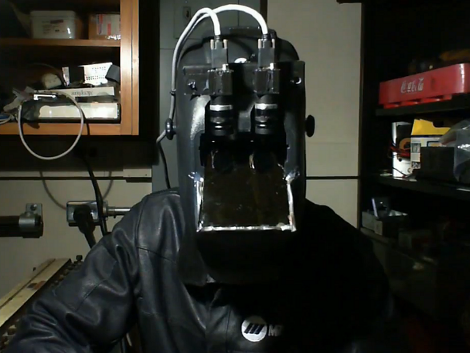 Traditional welding masks simply filter out light to protect the welder’s eyes. This mask doesn’t have a window in it at all. Instead, the mask includes two cameras on the outside and two LCD screens on the inside. It filters light by processing the video which lends itself to that grab-bag of features we mentioned earlier. Possibly the best of the system is its ability to selectively filter the brightness of the weld. What this means is that areas outside of the welding arc appear at a normal brightness level, whereas before they would have been greatly dimmed. A demonstration of augmented reality is also shown, where a computer monitors the welding surface, giving the welder a target to follow and measuring the distance between the weld and the filament. The video mentions that an FPGA would be well suited for the image processing, making us think this could be produced at a reasonable cost. After all, they already use X-ray machines for some welds, we’d bet a set of these helmets could be supplied to a crew at a similar cost.